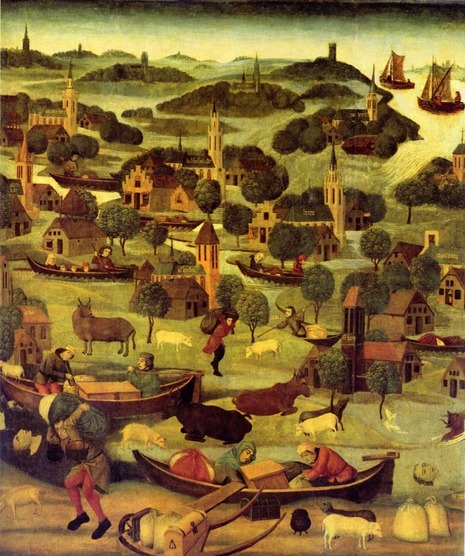 The St. Elizabeth's flood of 1421 was a flooding of an area in what is now the Netherlands. It takes its name from the feast day of Saint Elisabeth of Hungary which was formerly November 19. During the night of November 18 to November 19, 1421 a heavy storm near the North Sea coast caused the dikes to break in a number of places and the lower lying polder land was flooded. A number of villages were swallowed by the flood and were lost, causing between 2,000 and 10,000 casualties. The dike breaks and floods caused widespread devastation in Zeeland and Holland. This flood separated the cities of Geertruidenberg and Dordrecht which had previously fought against each other during the Hook and Cod (civil) wars. Most of the area remained flooded for several decades. Reclaimed parts are the Island of Dordrecht, the Hoeksche Waard island, and north-western North Brabant (around Geertruidenberg). Most of the Biesbosch area has been flooded since. The cause of the flood was not a spring tide like in the great flood of 1953 (see North Sea flood of 1953), but water from the storm in the North Sea surged up the rivers causing the dikes to overflow and break through. In 1421, the notorious Saint Elizabeth’s flood caused death and destruction in Zeeland and Holland for a second time. It is thought that the flood was caused by an extremely heavy north-western storm, followed by an extremely high storm tide. On November the 19th, 1421, a total of thirty villages and 2,000 lives were lost in the floods. In the night of 18/19 November 1421 (St Elizabeth's Day) an enormous flood engulfed southern Holland as the dykes burst at several points. Among the worst hit areas was the reclaimed land - the polder - of Grote Waard. The dyke broke near the village of Wieldrecht and the low-lying polderland was flooded with many villages disappearing completely. Survivors from the village of Wieldrecht took refuge in the nearby town of Dordrecht.